Located 2100 Palmer Dr. Janesville, on bike path Coordinates Lat N 42:40':461" Lon W 88:59':693"
In April 1832, unhappy about their forced relocation to Iowa and misadvised by tribal chiefs, about 1,000 Sac, Fox and Kickapoo men, women and children followed Sac war leader Black Hawk back to their Illinois home where the Rock River meets the Mississippi. During May and dune, Indian raiding parties attacked homesteads and settlements in Illinois and Michigan territories. At the May 21 Indian Creek raid, 15 settlers were killed and two sisters, the Hall girls captured. According to local tradition. 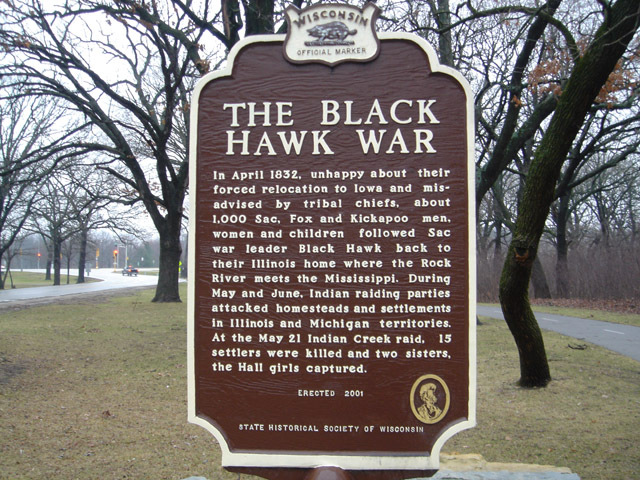 Black Hawk's band went north up the Rock River. camping several days here at Spring Brook Creek and giving the Hall girls to Winnebago Indians who later ransomed them to settlers. Pursued by General Henry Atkinson's troops. Black Hawk continued north. then west to cross the Mississippi. but most of the Indians drowned or were killed by troops In August at the Battle of Bad Axe. Three years later. 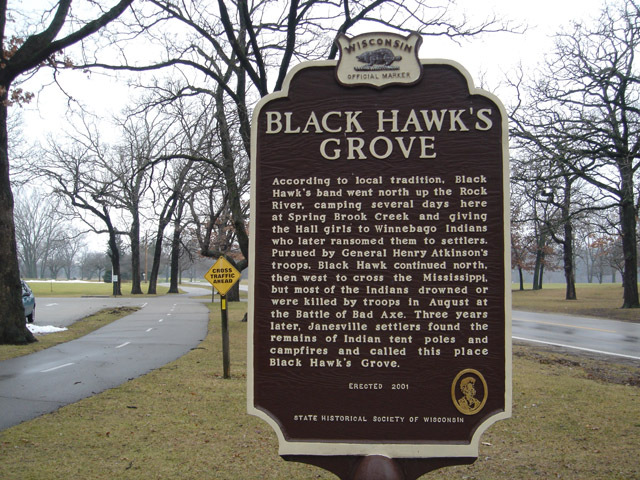 Janesville settlers found the remains of Indian tent poles and campfires and called this place Black Hawk's Grove.